A toddler strains his neck to look up at the friendly face of Mudgy the moose. Just peeking out from one of Mudgy’s antlers is a little mouse named Millie. It may be this toddler’s first experience with a Mudgy and Millie statue, but many other tourists and locals have passed by this place before. 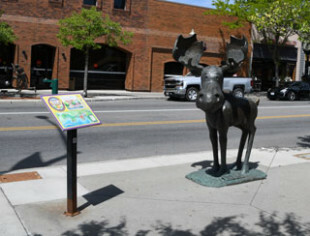 Mudgy and Millie statues in downtown Coeur d’Alene, Idaho, give residents and visitors alike a sense of adventure as they follow the Mudgy Moose Trail. 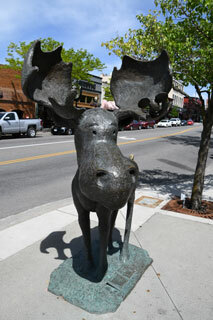 Mudgy and Millie play hide and seek at various locations in the town of Coeur d’Alene, Idaho. At each of the stops along the 2-1/4-mile Mudgy Moose Trail, Mudgy searches for his playmate Millie, who has secretly been hiding in his antlers all along! Next to each of the statues is a page from the book Mudgy and Millie, upon which the statues and trail are based. Mudgy Moose Trail winds through five points of interest in the town: from the base of Tubbs Hill to Independence Point. The trail was designed to showcase Coeur d’Alene’s beautiful hills, lakes, and public library. Susan Nipp, author of Mudgy and Millie and a longtime Coeur d’Alene resident, patterned the idea for the book on the “Make Way for Ducklings” statues in Boston. She wanted her project to support the Coeur d’Alene community. As a board member of the new Coeur d’Alene Public Library Foundation, Susan asked Charles Reasoner, a previous collaborator on her Wee Sing projects, to illustrate the book. She asked Terry Lee, a local artist, to be the sculptor of the Mudgy and Millie statues. The City of Coeur d’Alene’s City Council and Parks Department approved the statutes to be placed on city property, installed by Terry Lee. 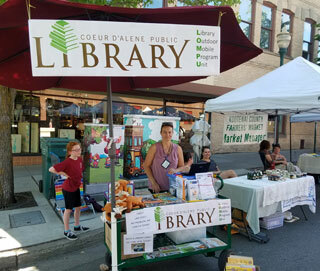 Barbara Brambila-Smith of the Coeur d’Alene Public Library talks with Farmer’s Market visitors. Sales of Mudgy and Millie books, stuffed animals, and other related story items benefit the library foundation. 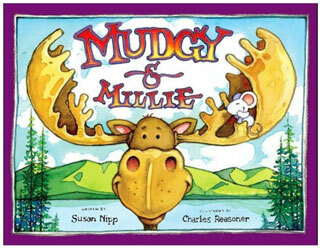 Proceeds from Mudgy and Millie books benefit the Coeur d’Alene Public Library Foundation. Since the book’s publication in 2008, more than 25,000 books have been sold, raising approximately $100,000 for the library foundation. 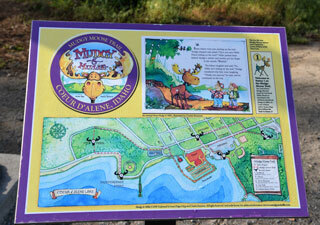 Alongside each life-size bronze Mudgy and Millie statute, a placard displays an illustration of the Mudgy Moose Trail and the page from the children’s picture book that corresponds to the visitor’s current location in Coeur d’Alene. The 2-1/4-mile trail leads visitors to five locations in the downtown and lake resort area to experience the town’s key points of interest. Mudgy and Millie have become the town’s mascots. Mudgy and Millie books, pictures, and toys frequently appear in parades and at schools and parks, in addition to having traveled all over the world. For Coeur d’Alene residents, Mudgy and Millie represent familiar places, and all the memories and stories made in their hometown. The ongoing success of Mudgy and Millie is shared by those who pass through Coeur d’Alene. People of all ages take pictures with and play games on the statues, as well as enjoy the beautiful and scenic walk through the town and along the lake. Mudgy and Millie by Susan Nipp, illustrated by Charles Reasoner, can be purchased from the Coeur d’Alene Public Library Foundation or locally from Figpickels Toy Emporium in Coeur d’Alene, Idaho. Feature photo: Life-size Mudgy and Millie statues and corresponding book placards lead visitors through downtown Coeur d’Alene. Alexander Pavlicin is an award-winning freelance writer and avid reader. He enjoys traveling to different parts of the world and exploring local communities and cultures.